Across the globe there is a wide assortment of environments. From the searing heat of Africa’s desert to the numbing cold of Antarctica’s wide open expanse. Within these extreme environments, as well as relatively calm ones, there are certain species that have evolved extreme adaptations to eke out an existence there. Probably the most well-known is that of the male emperor penguin from Antarctica. Emperor penguins breed throughout the Antarctic winter, 200 kilometers from open water. After the female lays her single egg she must return to the sea to feed and so passes her egg gently to her mate. The male than incubates the egg within a flap of skin located just above his feet; there it is protected from the harsh environment. For the next 64 days male emperor penguins huddle together to preserve heat while the temperatures plunge to -40°C. During this period they are also without food, waiting for the females to return. Even without food for themselves for 115 days they must provide nourishment to the young once they hatch, they do this by regurgitating a curd-like substance. All for the continuation of a species. Over 50 species of seahorses display an amazingly unique adaptation to the animal world. Male seahorses are equipped with a brood pouch on their ventral (front) side. When mating the female deposits her eggs in the males pouch which the male then internally fertilizes. 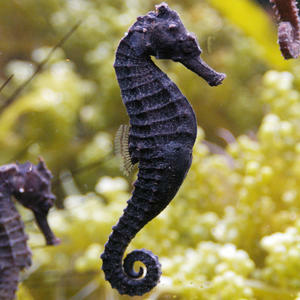 The male carries the eggs for two to four weeks and goes through muscular contractions to expel the young, emerging fully developed, miniature seahorses in the water. In the deserts of North America lives the only bird in the world that sees out the winter by sleeping. The common poorwill was the first bird known to go torpid, allowing its metabolic rate to drop below normal so that it uses less energy. Its body temperature drops from a normal 40°C to 5°C allowing them to torpor for as long as 100 days. Along with its ability to torpor its grey and black patterned feathers camouflage among the rocks and scrub of its native habitat. Another bird with an extreme adaptation is the hooded pitohui from New Guinea. It wasn’t noticed until 1989 that its plumage is poisonous. Scientists believe it acquires the poison from part of its diet, the Choresine beetles of the Melyrdae family. The toxin in the hooded pitohui feathers is the same neurotoxin found on the skin of poisonous frogs in South America. Another extreme animal is the common wood frog. This species of amphibian displays a rare trait called freeze tolerance. When temperatures drop the common wood frog becomes what may appear to be a frog-shaped ice cube. Two-thirds of their body is water and so freezes, its heart and brain cease to function, its breathing stops and for all practical purposes you’d assume the frog was dead. The frog’s metabolism slows to a crawl and its body temperature falls to between -6°C and -1°C, any lower they cannot survive. The common wood frog’s key to survival is a natural antifreeze that prevents their cells from dehydrating excessively. Glucose produced by their liver limits ice from forming in the body. When thawing begins the frog thaws from the interior out, this process takes place over a period of several hours. The heart is the first to thaw followed by the brain. Why do frogs freeze? Scientists believe this adaptation is related to their reproductive strategy because most freeze tolerant species like to breed early in spring, having this extreme adaptation allows them to thaw quickly and be ready to breed. Animals deploy a variety of mechanisms to deal with the cold, some hibernate and others migrate. Sometimes adaptations develops for other reasons such as diet, habitat, or relations between the sexes. But what it all comes down to is survival, as Darwin said, ‘survival of the fittest’, or the animal that has best adapted to its environment. Wow, I did not know that frogs could in effect freeze and defrost themselves, that is fascinating! Isn’t it amazing! So many species with so many curious and fascinating adaptations!